West residences provides fully furnished self-contained units, with six private bedrooms. They can accommodate up to 246 students. These residential units provide a friendly community environment for residents to live and study. Why live in West Residences? Fully furnished, self-contained 6 bedroom units available. West residences are fully furnished and self-contained units. Each unit includes 6 private bedrooms. Residents in West share all common facilities such as the kitchen, lounge room, bathroom and laundry with their fellow housemates. Each unit is equipped with two showers, laundry and kitchen facilities. 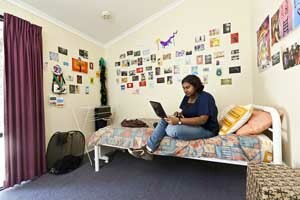 West residences are located on the Federation University Australia Gippsland Campus. View a map of the Gippsland Campus.